We are entering another election cycle at AAO-HNS, and it is gratifying and reassuring to reflect on the well-qualified slate of candidates for leadership positions in our Academy. The Nominating Committee, chaired by Immediate Past President Gregory W. Randolph, MD, concluded their work admirably. Rest assured, we have a talented pool of committed members here, dedicated to our mission, ready to serve and inspire confidence in moving our Academy forward! It is imperative that this organization remains the trusted source in maintaining the vital knowledge and “know-how” that is required as part of our professional commitment to patient care, research, education, health policy, and advocacy. While these efforts are critically important at home, they are increasingly important beyond our borders as well. We have an enormous opportunity to continue to demonstrate leadership and improve educational opportunities, networking, diverse collaboration, and care around the globe. 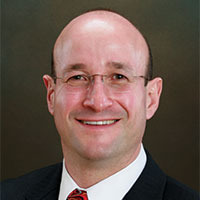 I am fully confident that as we enact the newly developed Strategic Plan—replete with bold initiatives to improve otolaryngology practice, physician wellness and resilience, data collection, etc.—we will continue to strengthen overall value for members and secure the future of private, integrated, and academic otolaryngology practice. 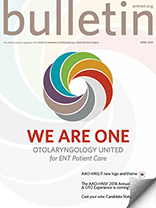 As part of the Physician Wellness Task Force program, the AAO-HNS plans on developing a robust “peer-to-peer” network designed to offer personal contact with a fellow otolaryngologist during times of need when a friendly voice of support can make the difference. When paired with local resources, identified through the Academy, we feel this will offer a significant opportunity that will benefit all in need. We will work through our component societies (SRF, WIO, and YPS), the BOG, and the Association of Otolaryngology Administrators to create a network that will be available to the diverse constituency across our specialty. This network will act as an adjunct to already existing support networks such as those within the WIO. Every otolaryngologist should be able to work less stressfully, more productively, and more profitably while preserving (and deepening) the inherent joy in caring for patients every day. There are many opportunities and forums for participation and leadership development in our Academy … education, committees, components (SRF, WIO, YPS), and Board of Governors to name a few. It is helpful and empowering to have a mentor during this process; it is also very rewarding to be a coach and mentor for a colleague. To thrive in this era—an era of healthcare disruption, changing business models and alignments in the healthcare marketplace, a rapidly evolving digital economy, and the so-called Fourth Industrial Revolution, the Internet of Things, in which we are immersed in machine learning, and artificial intelligence, where augmented and virtual reality, automation, and robotics are transforming not only healthcare, but every aspect of life as we know it—we must work together, as a unified specialty, with aligned goals, shared aspirations, and a clear vision of the future. I was fortunate as President-Elect of AAO-HNS to attend the American Society of Association Executives intense “C-suite” leadership training program in 2016, followed by the Leadership Program for Health Policy and Management at the Heller School for Social Policy and Management at Brandeis University for a week in June 2017, with a scholarship jointly sponsored by AAO-HNS and the American College of Surgeons. These opportunities were invaluable in preparing me for my current role as President of our Academy. I learned how much I did not know, and through personal growth, saw my leadership path evolve, recognizing that “servant leadership” and the ability to manage change remain necessary to keep moving forward in organizational leadership, especially healthcare. We will continuously lead and work with our specialty societies, private practitioners, academic otolaryngologists, the ABOto, and other key stakeholders to pursue our mutual goals and realize every opportunity that exists moving forward. We also have an important responsibility and opportunity to critically evaluate each candidate and to vote for those individuals who we can most easily identify with in helping to articulate our vision for the future of this Academy. “Great expectations create great capabilities!” Ray Dalio, Principles: Life and Work, Simon & Schuster, 2017.